EXIT STRATEGY offers an outstanding opportunity for both an entry level or experienced buyer looking to step into a 100'+ vessel that has benefited from stunning, modern upgrades. Run by two experienced rotational captains and dedicated crew, EXIT STRATEGY has been well maintained and lightly used by her current owner.An extensive interior refit was completed to EXIT STRATEGY's main deck, lower deck and Pilothouse in 2017-2018.On the main deck and in the Pilothouse EXIT STRATEGY has new wall coverings, new Amtico flooring, refaced cabinetry, new headliners, and new blinds. She also has all brand new galley appliances.In the four lower staterooms she has new wall coverings, new flooring,refaced cabinetry, newly painted doors, new valences and new light fixtures. Additionally, all the mattresses have been replaced with Tempur-pedic mattresses and all the guest linens have been replaced with new, high end linens. In the master stateroom, the master bath tub was removed and replaced with a massive walk-in shower accessed on "his" side. Should a new owner wish to have access to the shower on "her" side, the removal of the wall to allow access should be possible.Additionally, the lighting on board has been updated to LED and all the televisions on board have been replaced with new. 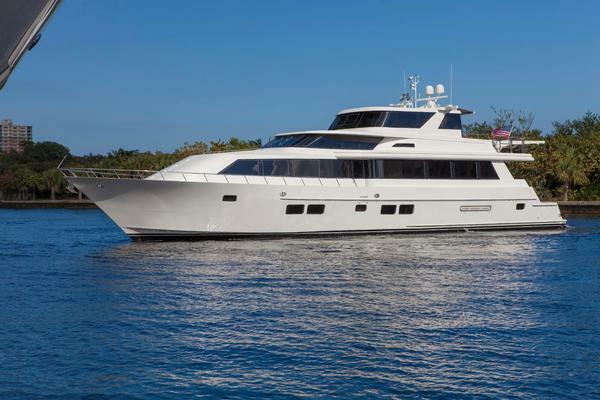 United Yacht Sales New Jersey would love to guide you through a personal showing of this 110' Broward Raised Pilothouse 1994. 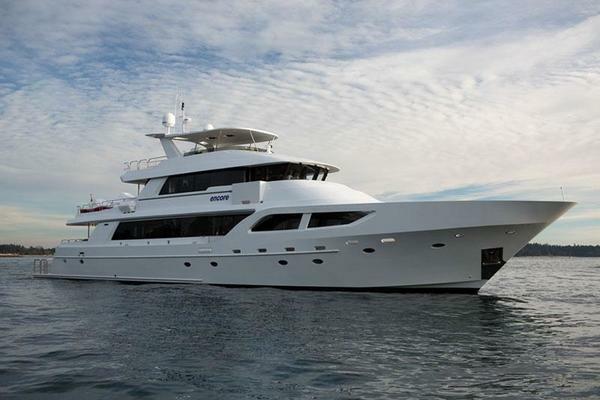 This yacht for sale is located in Nassau Bahamas and priced at $1,100,000. For a showing please contact us by filling out the form on this page and we will get back to you shortly! 1. Approximately $750,000 in updates since current owner took ownership in November 2016.2. Awlgrip paint job completed March 2019. Hull painted in "Kingston Gray." Topsides painted in off-white.3. New interior completed in a neutral palette, giving the boat a light and modern feel.4. 4 stateroom layout with accommodations for 9, including full beam master with king size bed, 1 queen cabin, and twin cabins- one with a Pullman berth.5. Run by two extremely knowledgeable rotational captains and additional dedicated crew; all with excellent credentials.6. Recent sea trial data available (March 2018).7. Captain has kept customized, electronic, PMS (prescribed maintenance system) in effect since March 2018.8. Desirable, open layout provides excellent visibility for families and charters.9. Ideal Bahamas boat with shallow draft. EXIT STRATEGY offers an outstanding opportunity for both an entry level or experienced buyer looking to step into a 100'+ vessel that has benefited from stunning, modern upgrades. 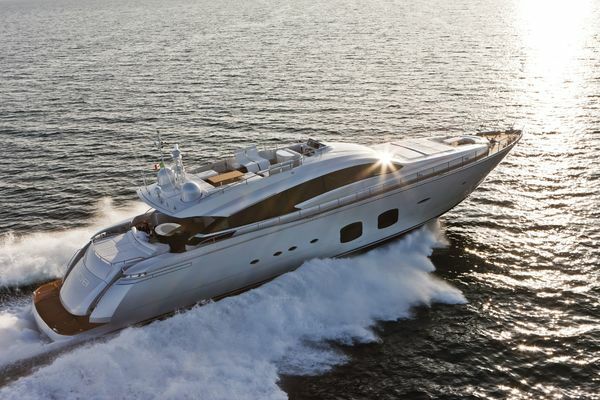 Run by two experienced rotational captains and dedicated crew, EXIT STRATEGY has been well maintained and lightly used by her current owner.An extensive interior refit was completed to EXIT STRATEGY's main deck, lower deck and Pilothouse in 2017-2018.On the main deck and in the Pilothouse EXIT STRATEGY has new wall coverings, new Amtico flooring, refaced cabinetry, new headliners, and new blinds. She also has all brand new galley appliances.In the four lower staterooms she has new wall coverings, new flooring, refaced cabinetry, newly painted doors, new valences and new light fixtures. Additionally, all the mattresses have been replaced with Tempur-pedic mattresses and all the guest linens have been replaced with new, high end linens. In the master stateroom, the master bath tub was removed and replaced with a massive walk-in shower accessed on "his" side. Should a new owner wish to have access to the shower on "her" side, the removal of the wall to allow access should be possible. EXIT STRATEGY provides accommodations for 9 guests in 4 lower staterooms, including a full-beam master stateroom, queen VIP stateroom, and two twin staterooms- one with an additional Pullman berth. All staterooms feature an en-suite bath with stall showers and vanities with custom, Corian countertops.The master stateroom and one of the twin stateroom's is accessed via a stairway at the forward end of the main salon. The other two staterooms are accessed via a stairway in the aft main salon.All the staterooms feature cedar lined closets, plentiful storage space, dedicated and updated entertainment equipment, as well as brand new Tempur-pedic mattresses and new, high-end linens.The crew accommodations are located in the bow and accessed via a staircase from the galley. The captain's cabin is aft with a double berth, private head and shower. An additional V-berth is located forward with two single berths. These two crew members share a head with shower that is accessed from the crew hallway. Should any trips require additional crew, there is an additional bunk berth in the captain's cabin that is traditionally used for the captain's gear. Aluminum hull and super structure with teak decking on the main deck aft and cockpit.Awlgrip paint job completed March 2019 at Cracker Boy Marine in Palm Beach, FL. The hull completed in Kingston Gray and the topsides are in off-white.All the porthole glass in the lower guest staterooms was replaced in 2018. The name "EXIT STRATEGY" is reserved and does not convey.All personal items of the owner and crew.A detailed list of exclusions will be provided at the time of sale, if requested.